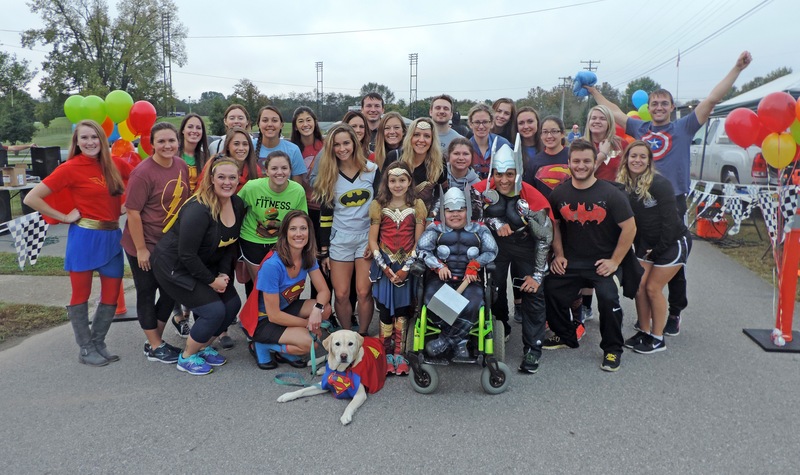 Belmont University participated in Garrett’s Hero Run on October 14, the Global Physical Therapy Day of Service, as part of the American Physical Therapy Association’s National Physical Therapy Month. This day provided a perfect opportunity for Belmont’s School of Physical Therapy to join with PTs in the community for a service event that supports a fellow physical therapist and Belmont alumna. Amber Sapp, a physical therapist and 2005 graduate of Belmont’s program, has an 11-year-old son, Garrett, who has Duchenne Muscular Dystrophy, a rare but fatal neuromuscular disorder with no cure. Every year, Amber and her husband, Randy, organize a 5K event as a fundraiser for Parent Project Muscular Dystrophy (PPMD), the largest nonprofit organization devoted solely to ending Duchenne. The race, Garrett’s Hero Run, encourages participants to dress in their favorite super hero costume to support Garrett. Currently, he is participating in clinical trials to help researchers find a cure so other children don’t have to face the same battles. The 2017 Garrett’s Hero Run raised more than $25,000 for PPMD to support research efforts towards a disease cure. Belmont DPT volunteers assisted in these efforts by volunteering on race day, helping with fundraising and providing auction items for the silent auction.